Well, This is a long story, but I will tell it and tell it as concisely as possible so that you'll understand my motivations concerning Indians. I am from the suburbs of Oklahoma City, Del City to be specific. I grew up there and now live right next door in Midwest City. I am a life long member of the Del City Church of Christ. I did spend about 12 years in Texas, 3 in Waco and then 9 in Dallas. I graduated High School way back in 1982 in Del City. I then spent two years at Oklahoma Christian and then moved on to Oklahoma State and OU. My field of study was in Media, Journalism and Radio Television and Film. I never did get a four year degree. I ended up getting a two year technical degree at Texas State Technical College in Waco. I have many unused college credits and am working on getting into a degree completion program asap. From there I want to get further education in theology and ministry. I had run out of time and money in about 1987 and had entered the work force. In 1987 I lost my support system. My mother and father divorced in 1987 after 29 years of marriage and my maternal grandparents which had lived nearby and always been supportive fell into very poor health and died. All this had a devastating effect on me. I will return to that, but first let me lay a little background. Before that turn of events my relationship to the lord had been touch and go for quite a while. In high school I was a football player and typical jock. I had discovered beer drinking and women. I carried this affliction with me to OC and with me everywhere for years. One reason this happened was because I had never been comfortable with the conception of God that I had been raised on. For starters, I am half Cherokee. Thus, the official version of American history I was presented with at school and even church did not match the political, cultural history of the American Indian as I knew it as a tribal member. At school I was told all about the glory of the U.S. and manifest destiny. At church I was told how God adored the US and had blessed its Christian forefathers and "gifted" them with this land. As a Cherokee I was taught about the other side of the story...The Trail of Tears and the treaty breaking mendacity and graft of these allegedly Christian forefathers. When I visited my Cherokee kin folks I saw the poverty, bitterness, heartbreak and ongoing oppression. It was very difficult for me to understand how God could allegedly condone this situation. I myself harbored confusion, bitterness and rebellion over this. I had also developed a taste for alcohol to fill in the void, so when life got tougher and more disappointing... I drank more. Substance eventually became a real problem. As I was saying, the Christian God I had been raised on and learned about in school did not hold all that much attraction for me. As I am sure you know, the Church of Christ has in the past been known for its legalism, ultra conservatism and intolerance. In Del City where I grew up there was at the time one the largest Southern Baptist Churches in the country. If you'll remember, the early eighties saw the rise of the Christian Right and the "reconstructionists" as a political movement with the Southern Baptists leading the charge. As a Cherokee, this reminded me a little bit too much of the politics and policies that led to the near genocide of my Native ancestors. Its also worth mentioning that there is a large Air Force base nearby Del City. As you know, the rise of the "reconstructionist" movement in the Church and American politics and the pro-military-industrial- complex mindset of the Christian-right political movement has gone hand in hand for quite some time now. Add to all that the constant tension between the Church of Christ I attended and the local Southern Baptist crowd and it was a recipe that I was simply not interested in imbibing in. Nowadays, in the toxic political environment that has grown out of all this, when I discuss these matters I am typically labeled as a liberal. I find this ridiculous. The truth is that I am so gospel oriented and biblically orthodox and conservative that people simply think I am liberal because I dare to challenge some of the notions of the so called "Conservatives" that have held sway for 25 plus years now. Enough about that. Simply put, the labels don't fit. 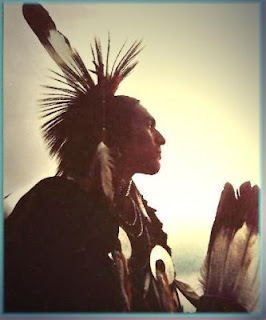 It was my Cherokee grandfather that eventually pointed me back to Christ- believe it or not. I had always known him as a full blooded, traditional minded Indian. He was also an alcoholic that was abusive to his family and my father in the past. He had also been a "Medicine Man" since the 1940's. Before, he would never set foot in a "White man's Church". By 1989 my life was out of control and I was exceedingly unhappy. I was estranged from God because of the dynamics and events I wrote about above. Yet, my conscience kept pointing me back to God and telling me I was missing something about Christ and the Church. Then the paranormal activity began. For the sake of brevity I won't go into all that- but let's just say some things started happening around me that I did not understand. I eventually learned that it wasn't just going on around me, but also other members of my family. It wasn't my imagination. I finally decided to go and talk to my Cherokee grandfather that I had not seen in five years. I knew that he was a Medicine Man and supposedly a spiritual leader that was supposed to know about all this paranormal stuff. I told him stories and poured my heart out to him...looking for answers...looking perhaps for the back door to Christianity and the doorway to Native spirituality. When I was done talking I just looked him in the eye with one question burning on the tip of my tongue. "What do you know about the spirit world?" was that question. Before I even asked, he reached into a drawer beside him and pulled out a worn out copy of the Bible. He held it up and said, "The answer to every question and concern you have is in this book." That is NOT what I expected to hear. So began my journey back to Christ and my education in spiritual warfare. Reaching my present state of mind, spiritual understanding and relationship with the Triune God has been a long process fraught with many trials and personal weaknesses, but by now, I can keep it to myself no more. My grandfather went on to tell me how this transformation had come about in him. Due to the years of hard drinking he had had an aneurysm in his esophagus. When it bursted, he had died.. or had one of those near death type experiences. He had been "dead" for several minutes. When he recovered and was aware after a time he asked to see my dad and his half brother, my uncle. Both of them have their own stories and had become Christians many years before. Grandfather told his sons that he wanted to hear more about this Jesus because he had just met him. He said Jesus had told him that he was very sorry about the plight of the Cherokee and all the other Native races... that this had NOT been the will of the Father. He went on to tell him about how Indian people had always known the Father and been loved by him but that now they must "Come through me" to the father. "I am the way and the truth and the life. No one comes to the Father except through me. 7 If you really knew me, you would know my Father as well. From now on, you do know him and have seen him." Grandfather was further told to return to his life and begin to teach other Indians about Him. He was given some tasks to perform and told to instruct his people that they did not have to stop being Indians to follow him and to pray in the name of Christ from now on. I know this is a bit of a fantastic story, but, I have to acknowledge the profound transformation in my grandfather and the results it produced. And so it began. When my grandfather began to carry out what he had been told, so began the spiritual warfare. This explained the "paranormal" activity that had been going on. Simply put, the forces of darkness seen and unseen did not want this change to occur. As I now understand it, the reasons are clear for this dynamic. When everyday, pew sitting, material thinking Christians begin to see the world again through spiritual eyes like the typical Indian does... like Paul talks about in Ephesians chapter 6, in the context of Christian discipleship, they'll be stomping all over the works of darkness and reaching the unreached like never before. The forces of darkness of course do NOT want this to happen. Unfortunately, the Church of Christ does not have much of a body of teaching about spiritual warfare. It should. My desire to evangelize Indians is wound up in these things and this is why I have the motivation, love and concern to reach out to them. I find the message of incarnational ministry and its implications very attractive. I know how far fetched some of this sounds. I have never been entirely comfortable sharing these things in a Church of Christ context because of the heritage of legalism in that group. After all, where I was raised we were so "conservative" it was essentially taught that even the Southern Baptists were Hellbound for their doctrinal liberalism. Can you imagine the amount of prayer and study I have had to engage in to reconcile all these things without falling into syncretism or extra biblical doctrine? By now I have my own body of experiences and insights on spiritual reality and the nature of God and Christ. I have to be able to share these things and talk about them comfortably and have mentors to carry out the calling I have. I would be glad to hear your thoughts and/or advice.